Quite superb – many thanks. We all thoroughly enjoyed it especially your company and the ladies who also came along. 'Just wanted to say what a fantastic time all the children had today. A great birthday party idea and you took away all the hassle...so we were able to enjoy time with the children. All the children were so excited on the way home, talking about there experience and even attempting to sing in Italian.... Your friendly and informal approach with the children really made you a hit. It was great that you could take a group of 8, 8 year old children and help them process such fantastic food. We for one will be spreading the word. Hope to see you again soon. Oh the joy of getting to Friday and realising someone else is cooking tonight! Such was my lot on Friday, 24th June at That's Amore Italian Family Kitchen's first "Guestorestro Evening". Hosted by Karen and Marco Migliore in their own home, I hope it will be the first of many. Much as I love cooking there are occasions when the week has been long, the inspiration has been lacking, and the cupboard looks a bit too bare for comfort. This was just such an occasion so it was a great relief when I remembered about our dinner date. I had booked with no small amount of curiosity: wouldn’t it feel a bit strange being a paid guest in someone’s home? And what if the other guests were, well, a bit odd? I need not have worried. Karen and Marco were welcoming and relaxed, greeting the six guests with a glass of chilled Prosecco with fresh strawberries. The four-course menu was delicious: Anti-pasti, bruschetta with tomatoes and capers picked by Marco’s family in Sicily, a wonderful pork dish with more than a hint of fennel accompanied by artichokes and broad beans (apologies to Karen and Marco: I cannot remember what it was called), and to finish a choice of coffee or lemon flavour Granita with a slosh of the same flavour liqueur. The food was fabulous, the company good fun and the evening was a sociable, enjoyable change from the norm I am already looking forward to the next one! 'I just wanted to thank you for a great day on your pasta making course on Saturday. Your enthusiasm, knowledge ( and patience!) is second to none. I am pleased to say that my family all enjoyed the remaining pasta that I brought home so much so that I have booked onto the second pasta making course, and my daughter has also booked on the children's cookery course starting in a couple of weeks. I am so pleased that i have found you, and will be sure to tell all my friends about your cookery courses if you promise not make me sing 'That's Amore' again! READ All ABOUT US in this Months Essential Living Magazine - on Pg. 80!! For a joint 50th Birthday Party. 40 guests and a Tango demonstration! 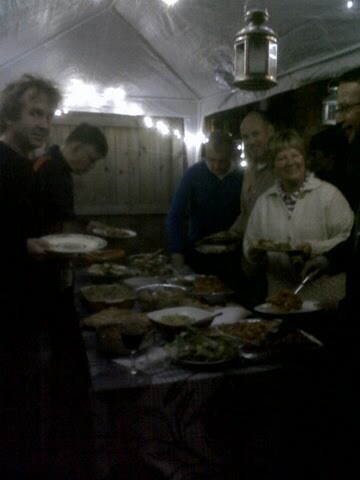 The wind blew but all were merry and well fed! Migliore and her family were absolutely wonderful at our May Food Fair on Gainsborough’s Richmond Park. Karen makes the most beautiful Italian food using local produce and does great demonstrations that are both friendly and informative. We loved your sausage making course Karen; more, actually as the day went on. We entered a spacious, well-equipped kitchen and a very friendly environment. We both – daughter on a treat – went straight into Karen’s comfort zone: all is possible, even me chopping red onions for the salad just like chefs do. The lentils to accompany them were already prepared: the meats and spices also to hand. First we took the skin off the pork belly and shoulder and scored it for home-made pork scratching which went into the oven after the bread dough had proved. Coarse mincing the meats came next: pork belly and shoulder as well as wild boar. Then we chopped strawberries into red wine and left them to macerate. I hesitate to describe the hilarity induced by the sausage making itself: suffice to say that size, firmness and consistency accompanied the stuffing of the skins by hand! We discovered that you can combine almost any meat with a few or lots of spices to customise your sausages to suit family and/ or occasion. We made: wild boar sausages with red wine, garlic and rosemary; the pork we tried in a variety of ways and then cooked a selection outside on a fire pit as well as flat breads baked on the hot bricks. The traditional accompaniment of lentils, here with red onions soaked in red wine vinegar diluted with water, was followed by the strawberries. Our sausages came in at about 95% whole meat.